Marjin Wall took up woodworking because she needed furniture for the house she moved into to attend Reed College in Portland in the 1970s. “I didn’t own any furniture, so I signed up for a wood projects class at Portland Community College so that I could make a desk for myself,” she says.After college, the Vermont native returned to the East Coast and earned a law degree before relocating to Portland, where she practiced corporate law for several years before retiring. Now she owns a safety-supply business, which gives her time to work with wood. She makes each candlestick from two or three pieces of wood joined with mortise-and-tenon joints, and finishes it with coats of milk paint. “I like to manipulate the colors and try lots of different things,” says Wall. 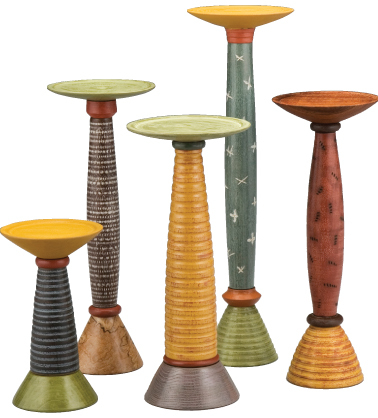 “If a finish doesn’t turn out, I sand it off and try again.” The heights of the candlesticks vary (the tallest is about a foot); they are 41/2 inches wide at the top. Each candlestick is $100. Contact Marjin Wall through the Mary Lou Zeek Gallery (335 State St., 503-581-3229 or zeekgallery.com) in Salem, Ore.